Greetings to Blog visitors as this will be the last installment written in Florida for some time. I am continually amazed at how quickly time passes when fully engaged with a business start up and volunteer service. I'm up early writing today's Blog as have an NGC appointment at 9:00am followed by a day of packing the GFRC business. I will try to load more Baltimore Newps but there are no guarantees. Blog readers well understand the amount of time necessary to build a quality collection. This journey could take multiple years or a decade to achieve certain goals as the numismatic marketplace is dynamic and locating certain pieces at desired grade levels requires persistence and some luck. The selling side of the equation is not as well understood or planned by most collectors. The concept of a coin collection life cycle Bell Curve may bring the challenge of dispositioning a coin collection into perspective. Many readers may find this graph to be unexpected or even alarming. Does Gerry really believe that it would take 10 years to properly sell the contents of an advanced collection if the collection took 10 years to assemble? Well then, let's step back for a moment and think this through carefully as the standard approach touted by the major auction houses is so contrary to this graphic. I believe we can agree that locating high quality coins including the rare dates for an advanced collection takes time. Personally, it took me 15 years or more to locate strictly original 1871-CC, 1872-CC, 1873-CC and 1874-CC dimes in certified EF grade even though many came to market during the 15 year timeframe. The issue was lack of originality and/or affordable pricing. Today, price guides values for these four dates have been impacted by the number of less than stellar examples coming to auction. These marginal examples reside in a certified TPG holders at EF and AU grade levels, but the surfaces may not be strictly original or worthy of a superior collection. What are the financial risks if I decide to sell my four Carson City dimes tomorrow at auction? First, there has to be several individuals currently building advanced seated dime sets who need these dates in EF grade and have the financial capabilities to bid an amount that is consistent with their true value when compared to marginal pieces that come to market. If these collectors are not available, then what happens? The dealers step into the equation and look for a wholesale price acquistion. Many of the more expensive coins sold at auction are purchased by dealers as they provide market liquidity. Let's consider a worst case situation....there is only one active Seated dime set builder in the market at the EF grade level and the overall market is soft as dealers are having liquidity issues. The probably of achieving maximum value is low as the collectors only needs to outbid the most aggressive dealer. Bringing top quality Carson City dimes to the market via unreserved auction may lead to seller's remorse. One well known example was the Stack's Alan Lovejoy sale in late 1990. Many of his pieces were sold unreserved for well below market value as the timing of his auction was during a dealer liquidity timeframe. Securing maxium financial return for top quality coins is derived by selling these coins to other collectors who understand their true value and have the financial strength to purchase. The numismatic market place can be impacted by many economic issues and is far from a level playing field as the price guides would imply. Selling a substantial collection and realizing the best possible prices will take longer that most of us had previously planned. Selling to collectors in a control manner can be accomplished via consignment with a well respect dealer who has the customer base for your coins. The dealer essentially brings about the laison between seller and buyer for a commission. However, this process can take time and patience to accomplish. Selling a collection via major auction house is straightforward but risky as one needs to negotiate terms, sign a contract and then pray for strong economic tail winds to bring collectors to the auction during the sales event. Market timing, auction venue and sale date are critical to secure maximum dealer exposure to ensure a strong backstop against potential weak collector demand.....there are many factors to consider when releasing a cherished collection to auction to secure a sale in a short time frame. The featured coin of the day is a most challenging 1857-S Seated quarter graded NGC AU50. This piece was purchased from an advanced collector at the Baltimore show and belongs in another advanced collection. The obverse is framed by original gold patina while the reverse sports blue and rose center that transitions to light gold at the rims. This is the first 1857-S quarter that GFRC has handled. A quick CoinFacts check indicates PCGS pop of four pieces in AU50, one in AU53 and five in AU55. Welcome to a new week and thank you for visiting the Daily Blog this morning. As GFRC customers and friends probably know, this is the northern migration week back to Maine home. Wintering in Florida proved to be a blessing this year and we are looking forward to returning to Maine in a few days. Already the www.seateddimevarieties.com homepage banner has been changed and lists the Maine mailing address. Please wait until Wednesday before mailing checks or other items to Maine address to ensure that nothing is caught in the USPS mail forwarding loop. Sunday was a long but productive work day; GFRC paperwork from the Baltimore show is mostly done and I was able to photograph an entire double row slab box of Newps and Consignments. Since the time is so limited to process images, load on price lists and write detailed descriptions, I'm trying something new....a Baltimore show preview page with just images and grades of each piece before loading up the car and driving back to Maine. The first right of refusal system will be in place for coins showcased within this table and I will engage with customers on potential purchases before and after the two day drive. The Baltimore show resulted in a substantial amount of new offerings as I was selective on what was purchased and also, my consignors now understand the type of quality coins that are associated with the GFRC brand. So the overall quality of new offerings is higher than in the past and I am most proud of this accomplishment. You can find the Baltimore show preview table here. I also wish to thank Greg Johnson for being a great Baltimore show table assistant and advisor on coin purchases. Finally, I also wish to thank the wholesale dealers who stopped by the GFRC table to offer coins consistent with my expectations. Buy and Hold - There are collectors who buy coins with no intention of ever selling in their lifetime or simply plan to leave this task to their heirs. Buy and Manage Duplicates - These collectors build a collection and are vigilant about selling duplicates in order to fund upgrades and secondly, to learn the resale value of prior purchases. They also may have a long term horizon for set building goals but realize that earlier purchases are best sold to clear space and monies for pieces at higher quality or rarity levels. Churn and Flip - There are collectors with very short attention spans who enjoy purchasing coins but become quickly bored with a series or their coins. They decide to sell within a few years of purchase and move on to something else within or outside of numismatics. Also in this group are the collectors who aspire to be dealers and will attempt to purchase coins that might generate a small profit if flipped quickly. Let's face the facts, most collectors are men and the "thrill of the hunt" drives our numismatic pursuits. We enjoy walking the bourse floor of small and large coin shows while attempting to complete a "coin collection." More recently, we spend time on eBay, visit dealer websites or employ major auction house online auctions as an alternatve "thrill of the hunt" to visiting bourse floors. Collectors spend much more time pursuing coins for their collection than thinking about selling their coins. This is human nature as we are taught at an early age to be consumers or shoppers with little education for how to dispose of purchased items. The same applies to dispositioning a numismatic holding that may have been purchased over 5, 10, 20 years or even a lifetime. However, selling coins from a coin collection is an important feedback loop and learning opportunity for refining individual purchasing skills. Without actively selling duplicates, there is no opportunity to assess the strenght/weaknesses of the purchasing side of the equation. Many of you might say, "I use a trusted dealer therefore I have nothing to worry about." That well may be the case but unlike doctors or lawyers that require years of university study, training and certification, there are no strict standards for certifying the skills and capabilities of individual coin dealers. For numismatic purchases, collectors should learn how to grade themselves and also self educate on the subtleties of coin surface conditions, striking characteristics and potential types of coin doctoring that are employed to "enhance" market sale price. How can a collector self educated? One potential approach is selling some duplicates as a feedback loop to the coin purchasing process. Remember that as human beings, if we are not making mistakes, then we are not learning. If a collector does not actively sell duplicates, then how can he understand if there were some mistakes or less than well thought out purchases that result in a substantial loss of monetary value? I'm going to leave this topic here and will have a follow up module in tomorrow's blog. This is a most important topic for all collectors to consider and tomorrow I will offer ideas for balancing the purchase and sale of numismatic items. The featured coin of the day is a pretty 1861 PCGS MS62 CAC half dollar that was acquired at the Baltimore show. Eye appeal and originality are high as the patina is light gold with enhanced blues at the obverse and reverse rims. This piece can only be found on the Baltimore show preview table and is priced at $1150. Baltimore Show - Day 3 March 28 Report. Good Morning everyone and glad to be back home in Venice...at least for a few days. I do wish to express a sincere thank you to GFRC friends and customers who visited with me at the Baltimore show and also, to loyal Blog readers. My Blog reached the 250 download milestone for two consecutive days while in Baltimore. Saturday show attendance was typical of any major show. The advanced collectors who had flown in were already gone and the local patrons were in attendance. I did manage to sell a few coins and most importantly, the 1738 Mexico 8R PCGS AU50. By 3:30pm, it was time to pack up and head to the airport and arrived in Tampa at 9:00pm. Reviewing the show in its entirety based on GFRC results and conversations with other dealers leads to the following summary points. Again, the comments pertain to 19th century coinage and not modern denominations. - The numismatic market is migrating online as more collectors use dealer internet website for pursuing their hobby. Major shows are becoming significant wholesale trading opportunities among dealers. Those dealers who specialize in wholesale transactions had a great show. Dealers who focus exclusively on retail need the support of a strong customer base at major shows to enjoy strong results. Taking that point further, dealers who are specialsts in certain market segments did well; both W. David Perkins and GFRC enjoyed solid Thursday and Friday results. Those dealers who are broad based and lack a strong internet presence complained of weak show results and losing money. I believe that the days are numbered for retail dealers who simply set up at major shows and count on bourse floor traffic for sales. The industry is presently transitional in nature as the U.S. population migrates to online purchases. - My table assistant, Greg Johnson, spent most of Saturday walking the floor and researching the availability of better Seated coins. His findings were dismal as there were few quality seated coins to be found outside of 2-3 speciality dealers. When we talk about "quality" coins, we are referring to those that have original gray surfaces without problems and reside in accurately graded TPG holders. For raw coins, the situation is even worst as nearly all nice original coins in the market place have already migrated into TPG holders. - The auction houses are not a strong source of quality coins as much of what is being offered is from dealers trying to lighten their load of non saleable coins. Yes, some collectors are using the major auction houses to disperse their collections. But the overall quality of major auction house offerings is not that high unless a well known named collection arrives to market. - If a collector wishes to build an advanced Bust or Seated collection and seeks top quality, then there are only two options. First is spending the time and monies to attend major shows, attend auction lot previews to sort through "the stuff" to locate the better pieces and also to walk the bourse floors and and try to find better pieces in dealer cases. Second, it is build a strong relationship with a few speciality dealers towards securing first right of refusal on their want lists. The balance of today will be focused on catching up on the show accounting workload and photography of all the newps and consignments. I will try to have some new offerings online before heading to bed. If you've read my Day 1 and Day 2 blogs, GFRC had a great show in terms of acquiring new inventory and I look forward to posting all these new coins. Tomorrow's blog will focus on an important topics that should be a must read for collectors who have amassed a five or six figure collection. This topic was explored in detail between myself and Greg Johnson at a quiet Friday night dinner and tested with certain GFRC customers and friends on Saturday. Collectors typically have a good strategy for building an advanced collection but give little thought to the sale of their collection when in the acquisition process. I will explore this topic tomorrow and hopefully raise awareness of the need to for collectors to establish a balance between coin purchases and sales as part of a healthy collection life cycle. Baltimore Show - Day 2 March 27 Report. Thanks for checking in...there were over 200 readers of the Day 1 Baltimore show report. GFRC enjoyed an excellent sales and consignment day on Friday. The bourse floor had the normal "buzz" as collectors were out in force and actively buying as compared to Thursday. The day started with the 9:00am LSCC meeting which turned out to have record attendance for a Baltimore show and nearly rivaled that of a summer ANA annual meeting. I was busy adding chairs to the meeting room as club members just kept filing in until the traditional attendees' group photo. We counted an amazing 51 people in attendance and had to take two group photographs that will be merged together in order to capture everyone. The meeting opened with the making of the new LSCC logo presented by Dennis Fortier and club member/graphic artist Jim Macor. John Frost gave a well prepared discussion about different digital photo file formats and how to prepare the best possible images to accompany Gobrecht Journal articles. Brian Cushing announced the new Seated Dollar website (www.seateddollarvarieties.com) followed by Len Augsburger announcing the summer ANA LSCC auction to be called by Heritage's Bob Merrill. Len closed the meeting with a review of his opening article in the spring Gobrecht Journal issue. Throughout the day, I received positive feedback about the club's transition and the strong display of club member support at the Friday meeting. Immediately after the LSCC meeting, Gerry Fortin Rare Coins opened for business and saw a steady flow of customers and consignors throughout the day. I am incredibly pleased to announce the contents of several substantial consignments that will have an important impact on GFRC inventory. Advanced collectors continue to realize that the GFRC consignment program is an attractive alternative to the major auction houses for selling duplicates and realizing a maximum return. On top of the consignments, I am also pleased to announce that GFRC has been selected to disperse a 36 piece 1861-O half dollar hoard and took physical possession of these pieces on Friday. More on this hoard will be forthcoming in a subsequent Daily Blog. Following is a listing of the consigned coins that will start to appear on price list next week. Besides working through the above consignments, I continue to build up Bust and Seated half dollar inventory to well position GFRC as a quality supplier of both Seated and Bust coinage. 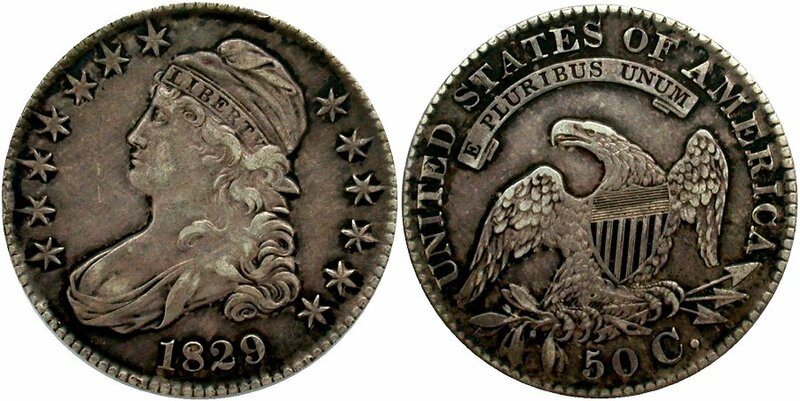 Some Newps include: 1806 PCGS F15 CAC choice eye appeal; 1809 PCGS VF35 choice original; 1854-O NGC58 with mint state look. By now, GFRC customers know the drill....send me emails for first right of refusal after I check individual want lists. Thank you to everyone for checking in daily; I will be back to Venice late Saturday evening and starting to work through the Newps and Consignments on Sunday. Please remember that I am driving back to Maine (a two day journey) next week so will be unable to load all the new inventory promptly. Baltimore Show - Day 1 March 26 Report. As always, thank you for visiting with me this morning and reading my Baltimore show report. This year's Baltimore show is in a new location; Halls F and G which accommodated more dealers. The only downside to the venue change is the poor atrium area with no seating otherwise the Whitman staff did a great job with preparations and booth setups. Attendance was good though the large convention room did quiet down around 3:00pm. Please understand that dealers started setting up at 8:00am, then early birds arrived at 10:00am with the floor opening to the public at 12:00 noon. The combined Gerry Fortin Rare Coins/W. David Perkins, Numismatist table was busy throughout the day with no breaks or downtime. The GFRC presence is impressive with 6 cases including 4 dedicated mainly to slabbed Seated/Bust coinage, 1 for raw coins and lastly, 1 case for World Coins while W. David Perkins had 3 cases loaded with Gobrecht, Seated and Bust dollars. The synergy between the two individuals is amazing given the broad range of original quality coins being offered. One of my Baltimore goals was to be an aggressive buyer and add more Seated quarter and half dollar inventory along with expanding current Bust half dimes and half dollars selections. I am very pleased to report that Day 1 was a strong buying day as customers, wholesalers and collector friends came to the table and offered a variety of coins for potential purchase. I was selective with strict originality and eye appeal being paramount but still managed to buy a reasonable amount of new inventory. More consignments arrived as I took in three lots during the day. Following is a listing of Day 1 Newps...I will announced consignment details in tomorrow's blog. Please email me quickly if a Newps may be of interest to you as some piece will sell on the floor tomorrow. Besides all of the above Newps, I have three consignments waiting to be processed. One is Seated coinage centric, a second has more World Coins including gold and the third will be announced in tomorrow's blog. It has been a long day and time for bed and well deserved rest. As with yesterday, the March 26 Daily Blog is being written on prior evening since Baltimore show dealer setup starts at 8:00am with breakfast at 7:00am. My Baltimore trip on Southwest had pros and cons...We were delayed several hours in Tampa due to incoming plane having New Orleans fog delay. That was the con. The pro was fact that many people were going to miss their connections and decide to move to other flights. By the time we left, the plane was only half full and setting was comfortable with no filled middle seats. I sold several coins while in transit yesterday including the 1869 NGC MS61 half briefly mentioned in yesterday's blog. Once in Baltimore, it was all business...I took in the Stack's auction lot preview and will comment shortly on the findings. After the Stack's preview, I met with an emerging New England wholesale dealer and went through his inventory purchasing a lovely 1861 PCGS MS62 CAC half dollar and a choice original 1875 NGC EF40 half...yes, the latter is a common date, but the strictly original surfaces are not based on what was seen at the Stack's preview. Locating quality seated coinage and being able to offer at fair retail prices takes a lot of work, connections and plain luck. The more coins seen, then the higher the chance of locating better quality pieces. Back to Stack's preview. It really is a mixed quality bag at these previews. There are the occasional spectacular Seated coins for the assigned TPG grades, the really ugly coins (dipped out white pieces) that have you scratching your head as who might want to buy these, the market acceptable coins that get certified and then the decent original pieces. I can't imagine sitting at home and using just online images to assess and categorize the offerings at a Heritage or Stack's sale given the amount of coins in each sale. Without attending an auction lot preview, I'm unable to properly check surfaces for subtle hairlines and defects, detect coloring under bright light or have an overall eye appeal sense based on the combination of luster and toning. I'm sure it is even more difficult for the casual collector and trusting the assigned TPG grades brings more downside risks, than upside potential as marginal coins are prevalent these days. March 26 is dealer setup from 8:00am to 10:00am with the early birds arriving at 10:00am and then general public at noon. I'm excited about this show as nearly all the GRFC inventory will be available to customers across 5-6 cases. I remember my first Baltimore show (Fall 2013) and having difficulty filling 3 cases and using generic Morgans to fill in the extra space. Please remember tables 1054/1056 if you are attending. The featured coin of the day is an example of what I expect natural silver patina to look like....a choice original 1829 bust half. The 1875 NGC EF40 seated half that I purchased today also has the same overall appearance as this coin. I'm leaving for Tampa airport early on Wednesday morning and this notice is written on Tuesday evening. Jim Poston's consignment arrived on Tuesday and there are two highlights, 1869 NGC MS61 CAC bullseye toning and 1871-S PCGS EF40 choice original half dollars. These are heading to the Baltimore show and are presently available but without images. Please email for a description and prices. Heading to Baltimore also means hanging out with LSCC close friends and I'm looking forward to the LSCC dinner on Thursday. Please check back each morning for a show report and the Newps that have been acquired along with consignments that have been taken in. Good morning to all loyal Blog readers and occasional visitors. Thank you for stopping by this morning. Yesterday was one of those busy non stop days with a substantial amount of packages shipped, Baltimore show preparations, trying to catch up on Open Registry submissions, Auburn Lakes condo board meeting and the final day of the condo unit site painting and issues resolution. I was awake at 5:00am and back in the GFRC office early this morning. The financial news of the day is that China's economy continues to slow with activity in China's factory sector slipping further in March. HSBC Bank monitors the China manufacturing index closely with their index dropping to 49.2 (anything below 50 means factor orders are shrinking). This means more calls for financial stimulus (lower interest rates and money printing) while the Shanghai stock market is up a crazy 50% in six months. A slowing China economy will continue to dampen oil prices as their oil demand growth slows and Saudi Arabia continues to pump at record levels. If you have an investment position in any of these groups (Oil producers especially frackers, Big banks, Funds that hold high-yield energy sector debt and finally Foreign governments that rely on oil revenues to stay in power), then I would be paying close attention to current risks as oil prices may not recover in 2015 or early 2016 until there is a substantial reduction in producing capacity. If the Saudi's don't plan to drop production, then pressure will continue to mount on the emerging United States producers. We are seeing a global oil war between the Middle East producers and the United States frackers that have brought massive capacity online. Without strong global economic growth, someone is going to lose this war and financial analysts are concerned (actually forecasting) that weaker United States producers who borrowed heavily will be the first to default on their loans. Oil sector defaults could start a chain reaction in the financial markets are high yield oil bonds become worth pennies on the dollar and then involve the banking sector. Memories of the 2008 housing sector crash should not be forgotten given developments in the United States oil industry. Back to GFRC and numismatics....I spoke with Jim Poston yesterday and his new consignment is arriving today via express shipment just in time for the Baltimore show. Jim always sends a nice selection of quality PCGS/NGC Seated pieces that sell quickly. Unfortunately, the new shipment will not reach the price lists until returning from Baltimore. Otherwise, today's priority is continuing to get shipments out the door before the show and then packing inventory for tomorrow morning flight. Finally, please remember that today is the last day to send purchase payments to my Venice Florida address. Starting tomorrow, I am asking all customers to hold mailing check payments until March 29 and then send to Maine address (225 Valley Rd., Raymond, Maine 04071). Upon returning from Baltimore, I will change the www.seateddimevarieties.com website banner to reflect the Maine mailing address. GFRC customers can still order coins and use either Paypal or Credit Cards as payment methods to capture items of interest. Today's featured coins will be on display at tables 1054/1056 and available for comparison and purchase. 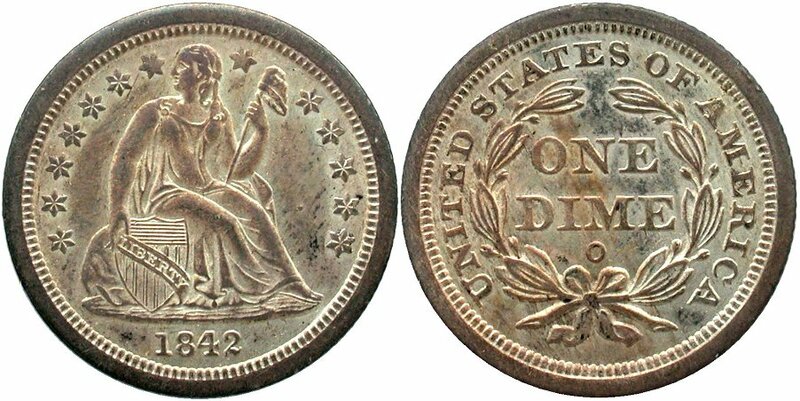 One does not often encounter 1842 New Orleans dimes in certified mint state condition and I am so proud to be able to offer two examples with excellent eye appeal. The first is graded MS62 by PCGS and approved by CAC, then second is graded MS62 by NGC and is the Kam Ahwash piece that I've highlighted in prior blogs. Either of these dimes would be a wonderful addition to an advanced Seated dime collection. Again thanks for visiting today and hopefully, I will see some of you at the Baltimore show. It really is amazing how quickly time moves along. The Whitman Baltimore show week has arrived and preparations are already underway. As a quick reminder, Gerry Fortin Rare Coins and W. David Numismatist will be sharing the combined space at tables 1054/1056. I'm most excited about the opportunity to operate in a larger space and feature all of the GFRC inventory including a case dedicated to World Coins. Please stop by for a visit to say hello. Remember that I will be aggressively buying quality coins and soliciting incremental consignments while in Baltimore. With social media, one is unable to hide aging and another birthday. Yes, yesterday was my 59th birthday and I wish to thank all the well wishers on Facebook and LinkedIn for their kind thoughts. The day was busy as most other days but saw a lovely dinner at the Crow's Nest in Venice along with a quiet Florida west coast sunset before returning back to GFRC shipments. When operating a personal business, each day requires careful attention to the multitude of tasks associated with sales and customer service. During the next 48 hours, I will be focused on Baltimore show preparations along with an Auburn Lakes Condo association board meeting this afternoon. Collectors and show visitors probably don't realize the amount of planning and tasks necessary to conduct a successful major show. Each customer has individual requests whether holding coins for viewing/purchase, TPG submissions and consignment rotations. Multiply these individual requests by 20 and add in all of the required inventory or sales paperwork and one can quickly ascertain the attention to details necessary to ensure that all goes smoothly with each customer. My priorities before flying on Wednesday are mailing all paid shipments, ensuring that all lay-a-way coins are segregated from regular inventory and then Baltimore show preparations. I will be traveling with new laptop at Baltimore so the Daily Blog's will continue per normal. Each day will bring a show report and listing of Newps or review of major consignments. Already, one substantial consignment has been committed and will transfer at the show. Secondly, I will be examining a significant lot of Seated halves for potential purchase. Thursday evening features the traditional LSCC dinner at the M&S Grill and Friday morning brings the LSCC regional meeting. So please check in each day per normal to read about the latest show happenings and important additions to GFRC inventory. 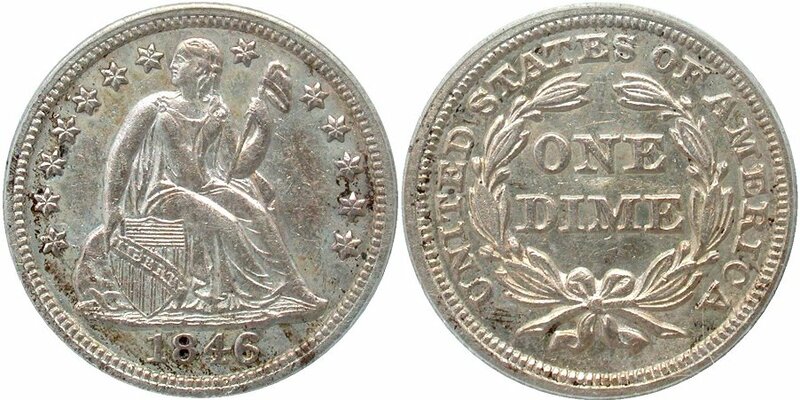 The featured coin of the day is a lovely 1876 Liberty Seated quarter with substantial eye appeal. I wish that more coins in inventory would have this appearance. Surfaces offer bold luster that is well framed with rich orange/gold rims. This is a common date coin in a showcase state of preservation. Today's Blog is a bit delayed as I'm in slow motion this morning. It has been a busy week at GFRC with strong orders and Baltimore show preparations. I'm glad that you've considered stopping buy on a Sunday morning. More new offerings were posted to the price list yesterday including the W-1 and W-14 1861-O halves, both graded PCGS EF40 along with a lovely 1863 PCGS MS63 seated dime. The 1863 dime has already received considerable attention with two individuals asking for first right of refusal....superior coins infrequently come to market as they are held by collectors and not dealers. When collectors decide to part with an entire collection or even a few duplicates, their pieces typically see strong demand if offered through an appropriate sale channel. Though I have only been in business since mid 2013, Gerry Fortin Rare Coins has become well known as a preferred sales channel for quality Seated dime and quarters. Now the challenge is to expand that expertise to Seated halves as I seek to handle a substantial collection or hoard during 2015. Please email me or better yet, if visiting the Baltimore show, please stop by at tables 1054/1056 to meet and discuss a potential working relationship. Overall, GFRC consignors are pleased with the way their coins are pre-marketed in the Daily Blog, followed by quality photography and detailed individual descriptions. My goal is to well represent your coins in a comparable manner to the major auction houses but with much more....ongoing dialogue, sales updates with no risks and uncertainties for the consignor. So please consider contacting me to discuss your collection and how we could partner together to market a few pieces or a substantial holding. Shifting gears...how do you evaluate a purchased coin when it arrives from a dealer? Since dealers offer return privileges, then there is always the initial question of how well is the purchased coin appreciated. Does the coin match the dealer's descriptions and images? Are there subtle defects or problems that were not properly described? As a long term collector, I went through this evaluation process countless times while building my Seated dime collection including the base set listed on the PCGS Set Registry. Granted that many of the pieces were purchased at major shows, via auction with lot previews and through auction representation via individuals that I trusted to see coins in the same manner as I would. But there was a subset purchased on fixed price lists with return privideges. My secret for evaluating a purchased coin was quite simple....80% of the decision process was made within 30 seconds after removing the coin from the shipping container. The initial eye appeal and first impression was a critical factor in the evaluation of a purchased coin. Collectors well know the feeling of opening a package, viewing the coin and saying WOW! as the coin is first view in hand and under bright light. If the reaction was, "yeah, this is an ok coin" or "man, this coin is not attractive", then the probability of a return was high. Of course, rarity and purchased priced are also critical parameters in the decision process when chasing truly rare pieces that infrequently come to market. Today's featured coin is the 1861-O Wiley-1 PCGS EF40 pre Civil War half that arrived on consignment yesterday. Only the Wiley-1 and Wiley-2 halves were struck by the New Orleans mint while under control of the United States government and are assigned R5 rarity. Thought most collectors seek 1861-O halves struck under Confederate control, those struck under Federal control are much more difficult to locate. The offered example is fully problem free and toned a nice light to medium gray. Both obverse and reverse diagnostics are clear for validating the W-1 attribution status. Please call or email to discusss this lovely example. Pricing W-1 and W-2 specimens is challenging so offers are welcomed. Welcome to the weekend before the Baltimore show and, as always, thank you for stopping by the Blog. Yesterday's commentary brought about more email comments, all positive. One can sense the frustration of the "silent majority" as I am old enough to appreciate the relevance of these two words. To ensure accuracy, I went to Wikipedia to capture the online definition of this term. What I found was interesting and wish to share today. When first used by Nixon, "silent majority" reflected those who quietly supported the Vietnam War. Today, its relevance is more generic to mean those in the Middle Class who are being overshadowed in the media by the more vocal minority. The silent majority is an unspecified large majority of people in a country or group who do not express their opinions publicly. The term was popularized by U.S. President Richard Nixon in a November 3, 1969, speech in which he said, "And so tonight—to you, the great silent majority of my fellow Americans—I ask for your support." In this usage it referred to those Americans who did not join in the large demonstrations against the Vietnam War at the time, who did not join in the counterculture, and who did not participate in public discourse. Nixon along with many others saw this group of Middle Americans as being overshadowed in the media by the more vocal minority. Of concern is media control, liberal or conservative bias and targeted age groups. Governments have always attempted to used media control to influence the thoughts and opinions of its citizens. Some regimes have been masterful while others were too overt and failed. From personal experiences, the Chinese Communist Party is a case study in the masterful usage of print and video media to influence and align the mindset of 1.5 billion people. I clearly remember the Tibet riots and the lost of internet access to all external news sources for a week after the Chinese crackdown. The China Daily featured lengthy articles by noted professors who explained the historical background as to why Tibet fundamentally belonged to the Chinese people. Chat boards were censored at the key word level by the omnipresent but subtle Chinese internet police. Overall, the response to the Tibet riots was well coordinated and successful. Another most notorious example is the Third Reich's control of media and institutions towards cultivating a well aligned silent majority during the late 1930s. 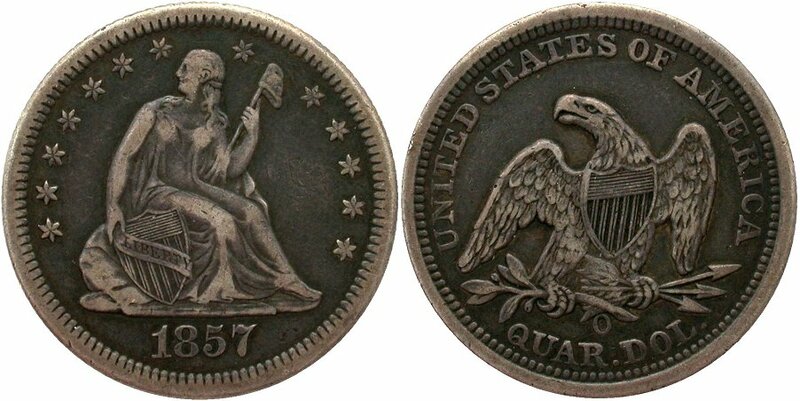 I was able to post a recent consignment with the Larry Briggs 1843-O Large O quarter and three nice Seated halves. Then yesterday afternoon, another promised consignment arrived including a choice 1863 PCGS MS63 dime that is frosty white and lustrous along with original 1861-O W-1 and W-14 seated halves. Both pieces reside in PCGS EF40 holders and are important offerings. These will be photographed today and posted to the price list before end of day. As mentioned earlier, GFRC is moving back to Maine the week following the Baltimore show. On March 24, I will change the GFRC mailing address from 502 Auburn Lakes Circle, Venice FL to 225 Valley Road, Raymond, Maine. Also, I will ask those individual requesting new orders to hold mailing payments to Maine address until March 30. USPS is currently experiencing problems as 1st class mail is taking over a week to reach Venice Florida from northern points. I just had a case of a 2 day priority box, mailed on March 6, arriving at its PA destination on March 20. Also a registered package mailed on March 6 is due to be delivered on March 23 in Washington state. To ensure that GFRC payments are not caught up in the USPS mailing forwarding loop, I ask that no payments be mailed to my Venice Florida address after March 24 and new payments are mailed to Maine address only after March 29. Please accept my apology for this inconvenience but it is better to anticipate the risks of lengthy mail forwarding issue in advanced and install a solution to avoid. I have no problems with holding coins during the March 24 through March 29 transition period as this is also the Baltimore show timeframe. Thank you for your understanding. Good Morning everyone and thank you for stopping by again at the Blog. I wish to start today's blog with commentary about the Federal Reserves latest press conference held on Wednesday....the "financial professionals" were expecting Janet Yellen to remove the word "patient" from her interest rate forecast, sending a signal to the markets that the Fed would start to increase interest rates at some point in 2015. Sometimes this high drama in the financial press is almost laughable if it were not so sad. We've become a society of living for the moment as fueled by the media with their efforts to maintain readership. I've always been a person to set long term goals and then working hard to realize those goals. So the daily drama in the press whether U.S. news or the financials rags turns me off. Let's step back and consider a few fundamental points. 1. The Fed has probably trapped itself into a position of low interest (ZIRP) for a long time. 2. The current U.S. economic recovered is fueled by low interest rates and debt creation. The "roots" of the economic recovery since 2008 are quite shallow as we experience the erosion of the middle class and the concentration of wealth at the top of the economic ladder. This is capitalism at work and share holders demand maximized quarterly earnings performance. The middle class casualties become a government issue as companies continue to cut labor forces in liu of automation and utilize other strategies like part time or contract workers. 3. Car loans with 72 month terms at very low interest rates are an example of the Fed's trap, the decrease in home ownership by the Milleniums is another. The current economic recovery feels unnatural as it is driven by free money and debt. Without a return to "normal interest rates" of 4-6%, savers have no incentive to save and are convinced to place monies in riskier instruments by the enlightened. 4. The current U.S. recovery is not self sustaining with typical capital investments, over production and mild recessions every 6-8 years as we experienced when interest were allowed to float at historical levels. Instead of a self sustaining recovery, our economy has become very addicted to low interest rates and debt accumulation. And the worst part is the addiction has spread to Japan and Europe. As I have pointed out in a recent blog, we live in the age of financial engineering. The Internet coupled with massive computing power allows for economic modeling at unprecedented levels and experimentation with the patient....the United States economy. I lost considerable monies in the tech crash of 2000 and luckily, saw the crash of 2008 coming and moved to cash the year before the bubble broke. But these two events scarred my psyche and as I approach retirement age, my appetite for risk is at an all time low. I don't trust the financial engineers to get this scenario right on a long term basis due to the amount of debt creation at hand. Governments can always erase debt with a currency devaluation and the careful savers experiencing the pain (reduction in living standard) as collaterial damage. The only protection against currency devaluation is physical gold ownership. As mentioned to a GFRC customer this week, starting in April, I am buying an ounce of physical gold every month and placing it in safe place. Once I turn 59.5 and can withdraw monies from my 401K account without penalties, I will probably increase the purchase rate and bring about a slow conversion of electronic monies to physical money. The downside risks appears limited while the insurance against the financial engineers stubbing their toes and saying, "Oops" will be in place. One can immediately see that physical gold as priced in Yen has returned to near 2012 highs due to the devaluation of the Yen by the Shinzo Abe government in a currency war with Asian neighbors. This graph illiustrates the use of gold as an insurance policy. Secondly, physical gold is private and not subject to electronic confiscation. Welcome back to the Blog and thank you for visiting today. Yesterday's blog generated a considerable amount of feedback...readers and friends agreed with the points being made and wondered how the traditional middle class can possibly be maintained. I will leave this topic alone and let others contemplate on the points made. After writing the Blog and packaging/shipping orders, I took a well needed break from GRFC business. We attended a Red Sox spring training in Ft Myers in the afternoon and had great box seats on 1st base line. The only issue was 92F temps with high humidity on a bright sunny day. The Red Sox bats were mostly quiet and I wonder if the Sox will secure their monies worth from Pablo Sandoval. He did not look impressive during his DH role yesterday. Sox pitching held up well (critical this year) and they won the game with some late inning clutch hitting by bench players Matt Springs and Jeff Bianchi. Evening brought email correspondece with customers and an update to the Auburn Lakes condominium website before finally calling it a day. There are no new Newps or consignments to report today. Consignment pieces mentioned during the March 16 blog arrived yesterday while I was at the game and will be retrieved this morning. If all goes well, they should be posted by end of day. Today's blog will be short as I need a quick shower and then have the final Auburn Lakes site walk through for workmanship quality assessment with the painting contractor. This project is essentially done and could not be more pleased with the outcome and the incremental personal time that will be available. The featured coin of the day is a recent purchase from the Ft Myers show. This 1835 Bust dime is very well struck and about as original as can be expected with even gray/brown patina. It is housed in PCGS blue label holder and accurately graded as EF45. All of the GFRC bust coinage inventory will be on display at the Whitman Baltimore show as I continue to expand offerings outside of Liberty Seated coinage that I am well known for. Is it Wednesday already? If so, then traveling to the Whitman Baltimore show is only a week away. Please remember that GFRC and W. David Perkins, Numismatist will be at tables 1054/1056. This is one of those mornings where I lack inspiration for an appropriate numismatic topic at the Blog. So, I'm going to get on my soapbox concerning the headline story from NBC News this morning that disturbed me. Having lived in China for six years, one acquires an alternate mindset by which to view global society and the approaches utilzed by various countries to organize and ensure the masses live in peace and harmony. This morning's NBC News headline is "What Happened to the Middle-Class America Family?" and goes on to reveal that the weak U.S. economy is responsible for the slow disintegration of the traditional family where the parents are married. Quoted directly from the article, "More than 40 percent of American children are now born to unmarried parents, down from just five percent in 1960, according to Pew Research Center. Fifty years ago, the vast majority of adults — 72 percent — were married. The same is true for only about half of adults today. The declines in marriage are especially pronounced in families with lower earnings. Tying the knot is increasingly a marker of class status in America." This is an amazing statistic and does not bode well for our country. Maybe I'm old and traditional but society needs a strong family unit to maintain a social order that has been around for ages. Children need a strong family unit to shape their morals and expected behaviors as teens and adults. China exists with a society that is godless (no formal religions allowed), is centrally controlled and for the most part, operates on corruption. But the Chinese family unit has been paramount for surviving generations of war and upheavels. Three generations are typically seen living together with strong respect for elders....secure families are key for weaving social order and individual safety nets for life's up and downs. A collapse of secure families leaves individuals dependent on society aka....the government which is expected to solve all of society's issues and ensure harmony via incremental laws and regulations. Our U.S. middle class in under attack on multiple fronts. Financial engineering leads to a concentration of wealth at the higher points of society. Political engineering leads to an ever growing entitlement system for those who lacks skills or motivation to cope with rampant globalization. Christian values (the belief in God and ability to express) are also slowly being eroded. Asian societies have historically embraced Confucianism. Confucianism focuses on the importance of the family, rather than on a transcendent divine. This approach rests on the belief that human beings are teachable, improvable, and perfectible through personal and communal endeavor especially self-cultivation and self-creation. Confucianism focuses on the cultivation of virtue and maintenance of ethics. Some of the basic Confucian ethical concepts and practices include rén, yì, and li, and zhì. Ren is an obligation of altruism and humaneness for other individuals. Yi is the upholding of righteousness and the moral disposition to do good. Li is a system of ritual norms and propriety that determines how a person should properly act in everyday life. Zhi is the ability to see what is right and fair, or the converse, in the behaviors exhibited by others. Confucianism holds one in contempt, either passively or actively, for failure to uphold the cardinal moral values of ren and yi. If you have read this far, then you should be rewarded with a featured coin of the day. How about this incredible 1757 Great Britain 6 Pence with huge luster and soft gold patina. King George II is the monarch on this lovely piece. As I explore world coins, the artistry can be fascinating and suggest that you might also consider. One of Monday's highlights was the arrival of two special pieces for potential trade. The first is an 1867 NGC AU53 Seated dime that is nice original light to medium gray and definitely a business strike (F-102). The second is an 1867 PCGS VF25 Seated quarter with amazing eye appeal....aquamarine centers that transition to gold rims. Today's challenge is too work out a deal with the owner for these scarce pieces. Email me if there is potential interest on either. In yesterday's blog, I mentioned the need to buy new inventory at Baltimore and hope that GFRC customers would be offering at the show. Let's discuss this topic a bit further this morning.....Based on past show experiences, wholesale dealers and individuals use several different approaches to sell me coins. Some methods are straightforward while others are not. The quality of the overall sales conversation and transaction is typically a function of how well the seller prepares and understand his/her product. Let's walk through a few scenarios and see if you can identify with these. - Make Me an Offer Approach - This is typically an unknown person who walks up to the table and wants a quick offer on one of more coins. These people are likely in a hurry as they wants to secure as many offers as possible. A subset of the Make Me an Offer sellers, are those who have not well prepared or are not really serious about selling. They use the Make Me an Offer approach to assess what their coins may be worth. - Potential Purchase but Contingent on Trade Approach - This individual spents time looking at inventory, reaches a purchase decision, negotiates a price and then pull out their coins for trade as part of the deal. These individuals take substantial time to service as all aspects of a sale a grounded in negotiations. Many times, the coins being offered are of substandard quality and the sellers uses a potential purchase to move along less desireable coins. - Are You Buying? Approach - These are individuals who have done their homework and reached a decision on the potential value of their coins and have an asking price in mind. The Are You Buying individuals can be sophisticated or inexperienced with value assessments but there is an initial basis for making a deal based on the target price and the quality of the coins being offered. - Vest Pocket/Wholesale Sellers' Approach - These are the experienced wholesalers or dealer reps who walk the floor with boxes of coins looking to sell at net prices marked on each coin. Working with these sellers is straightforward since a dealer can views a large number of coins in a short period of time and make rapid buy/pass decisions. As you can probably tell, I've listed the different sales approaches from least to most desireable. Dealers spend substantial monies to attend a large show and their time is valuable as show expenses cannot be recovered unless the dealer is activitly engaged in transactions that generate some profit. Many inexperienced collectors may not understand this point as their visit to a major show is hobby based and recovering show travel cost is not paramount. Dealers who typically attend one major show per month have an alternate perspective and must work hard to first recover show costs before the event can generate profit. So back to the different seller's approaches.....if you approach my table and wish to have an enjoyable discussions and potential sale, then please do advanced research on the potential value of coins being offered. There are enough online price guides coupled with Heritage Auction Archives to arrive at an asking price. I will typically not engage the Make Me an Offer individuals unless the coins are truly special. The surprise factor with the Potential Purchase but Contingent on Trade individuals leaves me feeling used...enough said here, please don't use this approach with any dealer and be up front on the payment method. I truly enjoy looking at offered coins if the sellers have done their homework. The well prepared Are You Buying and Vest Pocket/Wholesale Sellers approaches will receive my complete attention with quick reviews and most likely, a purchase. These individuals understand how to sell coins to dealers in an efficient manner while building a business relationship. If you are a collector and plan to offer coins at Baltimore, then please carefully research the potential value of your items and have an initial asking price to start the dialogue. You will find dealers able to render rapid buy or pass decisions and will likely explain why they passed if asked. The featured coin of the day is a rare piece, an 1846 Seated dime residing in PCGS AU50 OGH. How often does one see 1846 dimes offered at this grade level? This example is accurately graded Almost Uncirculated piece with minimal wear. Strike is above average with bold head and hair details, neckline and all stars having centrils. The reverse is also complete with all wreath leaves have bold veins. Surfaces are fully blemish free with residual soft luster. I believe the even silver appearance is the result of the coin being dipped before submission to PCGS in the late 1980s. Asking pricing has just been reduced and I hope you might consider this key date With Drapery dime. Welcome to the week prior to the Whitman Baltimore show and thank you for stopping by this morning. Sunday turned out to be an incredibly busy GFRC day after the morning walk. Orders arrived by phone and email while attempting to process and load the Ft. Myers newps and the world coin consignment. There were phone calls to discuss new consignments to arrive before Baltimore and/or Central States shows and these will be discussed during the week as details firm up . After a pizza dinner and wine, Diane and I worked until 11:00pm packaging eight shipments to go out this morning. GFRC customers will note that the handwriting on receipts is much more elegant as Diane has fully taken over the shipping process allowing me to focus on customer interfacing and processing more coins. The world coin consignment is photographed....this is another top quality offering and will be loaded today. I am particularly impressed with three Near Mint Great Britain pieces including an 1757 6 Pence with bold luster and sharp rims, an 1887 Florin natural rose/gold patina and finally, an 1887 Half Crown with pastel toning and excellent eye appeal. There are numerous Canadian and Great Britain coppers in this lot along with three New Zealand pieces. Three individuals requested to purchase the Federal Half Dime book by Logan/McCloskey within two hours of the Sunday Blog posting...this important reference is sold. I'm pleased to announce that following consignment will arrive this week and be available for viewing (if not sold) at Whitman Baltimore show. The consignor is a well known LSCC member and Gobrecht Journal author. 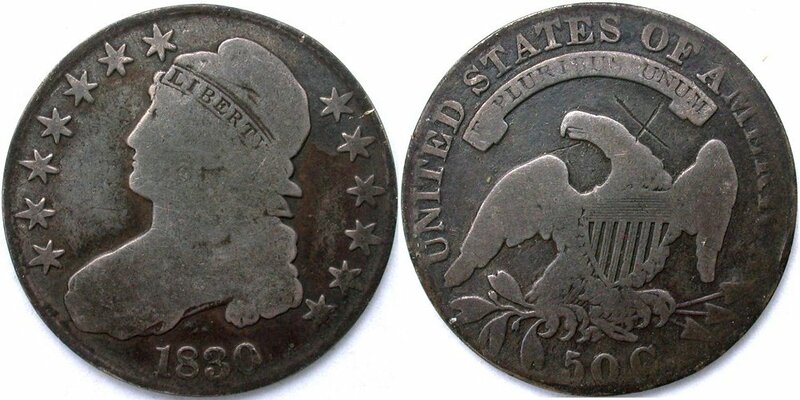 Seated 25c: 1843-O Large O SEGS EF40, "Larry Briggs Private Collection" label and his plate coin. This piece has the reverse slabbed forward and is a historic offering given the variety, former owner and plate coin status. Seated 50c: 1845-O PCGS EF40 WB-14 original with eye appeal, 1848-O PCGS EF45/CAC WB-23 choice original and 1857-O PCGS EF45 light tone over proof like surfaces. Today brings another long day of processing coin images and price list updates. Please remember that I'm always available for phone calls except during Monday and Tuesday evening between 8:00 - 10:00pm ET. The Voice is on and I hope to sit through this week's battle rounds without being interrupted. If you are thinking of consigning coins for display at the Whitman Baltimore and Central States shows, then please contact me in the next 48 hours and plan to have in the mail asap. I fly to Baltimore next Wednesday and packing on Tuesday. GFRC and W. David Perkins will be located at tables 1054/1056 and hope you will stop by to view the expanded double table display and new inventories. GFRC will have one case dedicated to World Coins along with the Maine Collection Indian Cent Set in NGC holders and balance of the Birmingham Liberty Seated Dime Collection as highlights. I will also be aggressively buying nice original Liberty Seated material at Baltimore to fuel growing sales. Please consider offering for a quick and straightforward review and purchase discussion. As a collector, I was always a tad intimidated with walking up to a dealer's table and offering coins for sale. Being on the other side of the table, I really enjoy when collectors offer coins for purchase or consignment. All I ask is that you have a well thought out asking price whereby I can make a quick buy/pass decision. Dealers are most busy at coins shows and don't appreciate those individuals who walk coins around the floor looking for best offers. The sales process need not be complex if you properly research your coins and set an asking price that is a win/win for dealer and seller. The featured coin of the day is a preview from the World Coin consignment. This Great Britain 1887 Half Crown is incredibly original, well struck and covered with pretty rose/gold toning. Collecting quality silver world coins with eye appeal need not be expensive and could be a refreshing side objective from the more challenging Liberty Seated series that are in strong demand. A quiet Sunday morning arrives and a perfect time to write today's blog. Thank you for visiting today. The Ft. Myers coin show was very well attended with the narrow aisles being nearly impassable during morning hours. This is a 30 table show sponsored by local Ft. Myers coin club and held in a smaller Masonic hall. Most of the dealers faces were familiar as having seen their inventories at Venice, Lakeland and Sarasota shows. But I did manage to locate two new faces and bought a significant amount of nice original pieces. The first was local Cape Coral dealer and the second was a 74 year old private collector who was selling off a subset of his collection. The latter gentleman had an excellent eye for originality and collected capped bust half dimes and dimes along with other 20th century denominations. I spent monies which were well above expectations for a small 30 table show and drove back to Venice pleased with the effort. Newps will be listed towards the end of the blog. Once back home, another consignment arrived with a rare piece...1872 PCGS EF40 3 cent silver with mintage of 1000 along with several other coins. The 1872 is housed in early generation blue label PCGS holder and sports old time rose/blue toning that one associates with proofs. This piece is already on hold and will not reach the price list. The balance of the coins include rare and choice 1856-O F-104a die state in raw Fine 15, an 1812/11 bust half graded VF30 but old reverse clean and nice F12 1860-S seated half. I spoke with one of my major consignors yesterday and we are planning to move a portion of his unsold Seated dimes to the Discount lists in the next two weeks. This individual continues to aggressively pursue higher grade pieces and wishes to convert selected consigned pieces to cash in the near term. Watch for an announcement towards the end of upcoming week as we shift some inventory from regular to discounted price lists. The new world coin consignment is due to be photographed today and will be place in the queue for price list loading by Tuesday. This offering is heavy in Great Britain and Canada coins. Contemporary Counterfeit: 1830 bust half and possible Davignon 13-M which is quite rare. This is one of the nicer counterfeits I've had the pleasure to own. The featured coin of the day is the 1830 capped bust contemporary counterfeit with its uniform strike and pretty old original patina. If it would not for the X on the reverse by eagles head, I would label this piece as a gem. Weight is 12.4 grams and width is 31.7 mm while metal is unknown. Edges lack lettering and the rims are nice and sharp and undisturbed. This appears to be Davignon 13-M but more research is needed as 13-M is a rare variety. I'm up early and driving to Ft Myers shortly to attend a local coin show this morning. As a result, the blog will be brief. Please check back tomorrow to learn what I was able to locate at this 30 table one day show. Friday was spent loading Newps and selections from the consigned type set. The world coin consignment is still in the queue and will be processed with coins purchased at Ft Myers. I hope you will check back tomorrow for a regular Blog edition. The featured coin of the day is a lovely 1826 F-108a PCGS EF40 bust half dollar with pretty old album toning. Under bright light, the eye appeal is all there with a combination of rose, blues and gold patina throughout obverse and reverse. It is a pity that my photography is unable to capture the full extent of the toning and eye appeal. Friday arrived and it is March 13th.....hopefully today will be a quiet and uneventful day. Thanks for visiting the Blog. I would like to open today's commentary with an issue facing coin dealers and collectors; problem coins that have slipped into regular PCGS or NGC holders continue to float around from dealer to dealer until purchased by an inexperienced collector. This week, two problem Seated quarters made their way to GFRC as I strive to locate better dates with nice eye appeal for customers. The coin doctors have left a legacy of problem coins in the industry and their handy work is good enough to be graded in regular TPG holders. Both Seated quarters were in the EF45-AU53 grade range and obviously not original when inspected with a 10x loupe. Using the term "not original" is probabily being kind....these coins were flat out worked on or manipulated. - The first (NGC AU53), mostly likely had been stripped or dipped and then exposed to a chemical to evenly retoned the surfaces a perfect dark brown. Under the artificial toning were mildly reflective surfaces so the piece could pass a bright light check but a 10x loupe inspection revealed pockets of micro pitting on Liberty from the stripping. The give away is the perfectly uniform color. Silver coins rarely tone with the identical color throughout obverse and reverse (uniform across fields and main devices) when in a natural environment. This piece is being returned and the NJ dealer who sold it is not pleasant about the return experience. - Coin #2 (PCGS EF45) has substantial eye appeal in hand but once placed under bright light, the polished surfaces are immediately visible. The fields are full of micro scratches or pits from a cleaning. Then the coin appears to have been retoned with attractive blues and rose coloring. Finally the surfaces were lightly polished to increase light reflection. This piece is also being returned and the dealer is very supportive about the process. I hope that GFRC customers might understand two points from today's blog. First, my business ethics are such that I make a strong effort to not sell coins in TPG holder knowing they have been manipulated. For raw coins, a full disclosure is made in a coin's description as to what I believe are the surface conditions. For holdered coins, the same but all efforts are made to not stock problem coins in regular TPG holders. Secondly, buying a coin in a regular TPG holder brings no guarantee that the coin is original or has natural toning. The primary guarantee that one secures from the TPGs is that a holdered coin is genuine; they will honor returns for counterfeits or altered coins that slip into their holders. But beyond that, the TPGs provide an opinion of a coin's grade and surfaces condition. The evaluation of any collectible whether art, ceramics or coins is highly subjective and requires expertise that can only be acquired with years (really a lifetime) of personal training. The hobbyist should realize this point and work with the best in the respective collectible markets for self education and ensuring that their monies are wisely spent. - 1851 NGC AU53 25c...a strictly original and rare example with light gray patina and pretty blue/rose under bright light. - 1807 PCGS F12 CAC 50c..perfect for the grade with even gray surfaces and completely blemish free. - 1828 PCGS EF45 50c...choice natural toning gray/rose patina with more colors under bright light. Tomorrow brings the Ft. Myers one day coin show which I will attend in the morning and hopefully can find a few nice Newps for the effort. The featured coin of the day is a raw 1857 New Orleans Seated quarter that illustrates what natually toned silver surfaces should look like. For the well experienced collector, this piece has it all including originality, a full strike and overall eye appeal. I believe this quarter would easily grade and probably be approvbed at CAC. This is "the Gerry look" that I strive to locate during buying trips. Is it really Thursday already? Probably....so time to write another morning blog and thank you for visiting with me today. Writing yesterday's blog on Tuesday evening proved to be a wise step as the condo association project started at 7:45am with a knock on my door. The door replacement workers arrived early and wanted to get going. The day turned into a significant coordination effort between the door installers, painters, condo residents and board members chaperoning the work and holding condo unit access keys. Overall, the activities went smoothly except for the typical unexpected issues; a custom door/frame in a unit that needs full replacement, newly made keys marginal cut and not functioning, occasional marginal painter workmanship (unit owner complaints) and resident special requests. We called it a day around 3:30pm and I immediately returned to GFRC biz to handle orders, chat with customers and update the website. Dinner was Chinese take out and then worked until 10:30pm reviewing recent type coin consignment pieces and issuing my well known consignment spreadsheet to owner for finalize asking prices and kicking off the price list loading process. Birmingham Collection sales have been strong and above my expectations. Actually, I looked forward to having a fair number of the Birmingham dimes at Baltimore, but this will not be the case as many are already on hold. Even the well struck 1866-S F-101 PCGS45 that I took in as part of a trade towards the Birmingham 1866-S last only three hours before being scooped up by an avid GFRC customer and friend. The GFRC collector to collector trading desk concept is gaining momentum as top coins move between advanced collectors in a well facilitated manner. This morning's emails brought two more consignment inquires including an individual wishing to move along an 1863 PCGS MS63 dime and two 1861-O PCGS EF40/45 halves that are better varieties in the Wiley designation of CSA, Federal or Louisiana strikes. I'm constantly watching global financial news as some of you may have noticed. This morning's news indicates more easing with South Korea dropping interest rates as their GDP projections for 2015 decreases from 3.9% to 3.4% with more downward revisions coming throughout the year. The key issue is weakness in the China economy. As Americans, we probably don't pay much attention to China's economic stability, but we should. China is the world's second largest economy and a significant slow down will have global repercussions given the background of ongoing debt growth. World economies are slowing down and standard operating procedures are to lower interest rates and issue debt throughout the global financial system. Banks issuing loans creates money and funds economic activities in the short term.....but long term, this debt burden hangs over governments, companies and individuals. Unless there is substantial GDP growth to repay the debt (deleveraging is the popular term), we could be facing some difficult times. Substantial GDP growth appears unlikely since the world is transforming to Information Technology and automated factory economies that bring about substantial efficiencies and much less need for physical labor. The amount of global debt being created is unprecedented in human history; this is a massive financial experiment to permamently avoid recessions.....let's hope that the central bankers and economists have the situation under control. Today brings less involvement with the condo project, shipping orders and a trip to NGC to retrieve a world coin submission along with more GFRC submissions. Please be aware that during the past week, I have been quietly purchasing new inventory from special sources and those coins should be arriving today. By the weekend, my goal is to have a substantial amount of new offerings posted across many of the price lists. The featured coin of the day is the lone proof dime in the Birmingham Collection and has yet to be loaded on price list. This will be accomplished by end of day and below is the preview......an 1882 NGC PF66 Ultra Cameo specimen with not a hint of toning and appears to have been struck yesterday. If you may be in the market for a Seated dime proof type coin, then this offering should garner consideration. Good morning everyone and welcome to another Wednesday. This Blog edition is being written on Tuesday evening as I have an early Wednesday morning start for the final stage of the Auburn Lakes condo painting and door replacement project. You can't imagine how pleased I will be when this project wraps up next week. Overall site inspection is Friday morning so lots needs to get done on Wednesday and Thursday. The monthly LSCC officers' conference call just finished and happy to report that club membership stands at 615 after the dues renewal process. We experienced about 50 non renewing members which is always a disappointment. The 615 baseline number is an excellent starting point for the 2015 membership recruiting campaign. Our club is ramping its presence at smaller regional meetings and is preparing a host of finely tuned Liberty Seated presentations that will be made available to regional directors or club members for use at regional or local coin club meetings. Education and mentorship is fundamental for enabling the next generation of Seated coinage collectors and LSCC new members. My goal is to raise overall awareness of the LSCC and Liberty Seated coinage across the numismatic industry. I finally completed loading the last of the Birmingham Collection Seated dimes on the price list and the resulting sales action has been strong. Quality coins residing in accurately graded TPG holders are constantly in demand. If one reads the individual descriptions carefully, it becomes evident that most of the Birmingham dimes reside in old PCGS blue label holder that immediately followed the OGH generation. Grading within these old blue labeled holders is accurate in my mind and conservative against present standards. The balance of the Birmingham Collection will be available at Baltimore...please come and visit tables 1054/1056 with W. David Perkins. New consignments were photographed today and I'm facing long hours of image processing before loading on price list. The next major price list updates will occur on Friday and during the weekend. Thursday is already booked with a trip to NGC for more customer submissions and other GFRC administrative tasks. If all goes well, I will try to attend the Ft. Myers local coin show on Saturday. Wednesday morning breaking news...I just took in a wonderful 1866-S F-101 PCGS EF45 dime with hammered strike in trade on one of the Birmingham Collection pieces. I originally sold this dime and will posting to price list with prior images later today. I've decided to showcase two Coins of the Day on Wednesdays. The first is a traditional United State piece while the second is from the World Coin price list. With the expanding GFRC inventory, I sometimes feel limited when only showing one favorite coin per day....since this is my website and blog, the self imposed rules can be modified. First up is a sweet toner 1879 Morgan dollar. This Morgan was selected due to the double side toning over proof like fields. 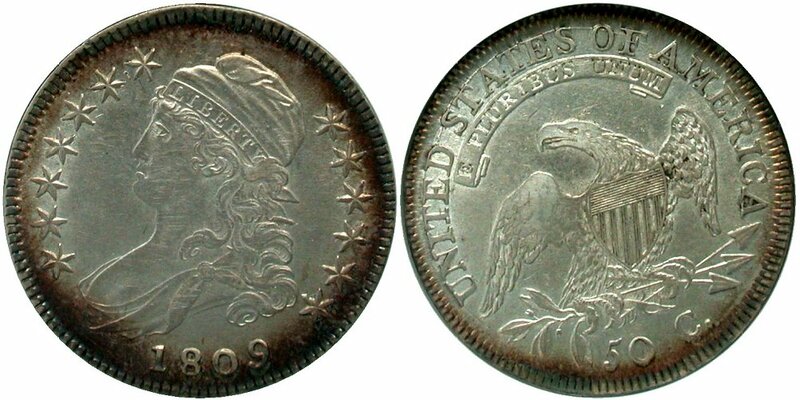 Please remember that 1879-S Morgans typicall are seen proof like while the Philadelphia struck coins come frosty. Second is a strictly original 1890 Great Britain 1 Penny with lovely surfaces and chocolate brown patina. I enjoy handling British pieces from the Victorian era. .
Tuesday arrives and time for another Blog edition....Thank you for consistently checking in each day. Consignments arrived yesterday and are the primary topic for today's Blog along with touching upon world financials. Let's start with the world financials first. The Euro is plunging and will soon approach parity with the U.S. dollar. Just this month, the Euro is down 3.6% with the European Central Bank (ECB) starting its version of QE this week. If European block economies are not healthy, then this spells trouble for China. Europe is China's largest trading partner (not the United States) and a weak European Union (EU) means China's export issues will continue to grow leading to more difficulties for the Middle Kingdom. On the other hand, the U.S. dollar continues to strengthen which is great news for American consumers and tourists. The downside is an excessively strong dollar which will impact the earnings of the multinationals corporations as currency exchange will have a significant impact to their bottom line performance. As I watch the U.S. dollar continue to grow in value on global basis, I wonder how this will end and what event will trigger a reversal. A quick recovery of oil prices does not appear to be on the horizon so less U.S. petrodollars will be necessary. At some point, U.S. exports will be impacted as too expensive while European goods will flood the United States. Through all of this, gold and silver will be impacted due to strong dollar and deflation potential across the globe. Three consignments arrived yesterday afternoon bringing about a diverse addition to GFRC inventory. Let's quickly walk through each one. Consignment #1 included two Seated dimes....1861-S VF30 raw and 1862-S F12 raw. Both are nice pieces and perfect for Dansco collections. 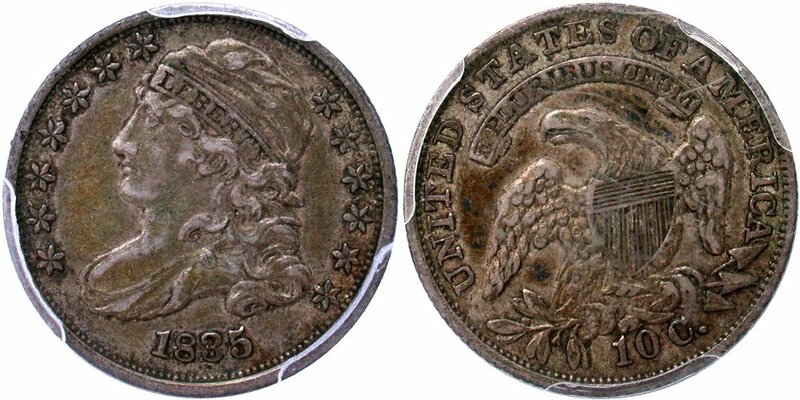 The customer also included some lovely NGC dimes for reholdering; one of which is an 1865 graded MS63. Consignment #2 was a world coin lot which included (4) Canadian pieces, (6) Great Britain pieces along with some New Zealand, Nicaragua and Norway offerings. Consignment #3 was the 19th century type set lot previously mentioned in the blog. There are some highs and lows within the consignment as the owner purchased from a local coin shop. I will be working with the consignor to explain the wide range of surface conditions on these pieces and decide how we will disposition across regular and discount price lists. Moving on to the Birmingham Collection....all of the Seated dimes in this collection are loaded on the price list and those not sold by Baltimore show will be available for on site viewing and purchase. Tonight is the monthly Liberty Seated Collectors Club conference call for managing a host of existing and new club programs. I am particular excited about the upcoming club auction at the ANA annual meeting and the growing number of LSCC exhibiting events at smaller regional shows. For example, discussions are underway concerning the potential display of my PCGS Set Registry Seated dime date/mintmark set and Top 100 Varieties collection at the late October Rochester, NY show. Last year, the LSCC was well received and hosted by the Rochester Numismatic Association so my goal is to help out with this year's show promotion and allow my Seated dime collection a chance to see daylight for a few days. The featured coin of the day is once again from the Birmingham Collection and one of my favorite pieces in the entire lot. This 1884-S F-102 dime resides in PCGS MS64 holder and surprisingly did not receive CAC approval. I thought this piece was a lock for the CAC green bean and this goes to show that judging eye appeal is highly subjective. I love this dime and even considered adding to my own collection due to the bold strike for a F-102 along with the rich gunmetal gray/blue on the obverse and blue/rose patina on the reverse. Overall, this piece is so original and belongs in an advanced collection. Serious fans of the Liberty Seated dime series should pay special attention to this 1884-S dime. Sunday is traditionally a day of rest, but yesterday flew by as I juggled multiple projects; the Auburn Lakes condo site door replacement and painting project with the final site inspection due for this Friday and preparing GFRC Constant Contact mailing that was intermixed with indivdual customer communications and sales. This condo project always brings small surprises including the discovery that two adjacent units shared the same keyed locks due to an error when the site was constructed a decade ago. Luckily one unit owner immediately agreed to have new keys made during the door and lock replacement process. Yesterday was a busy sales day along with new conversations about potential consignments. One of the noteworthy items is an 1872 3 cent silver piece graded PCGS EF40 and attractively toned. 1872 is the last year for business strikes with a tiny mintage of 1,000 pieces; the opportunity to handle one of these rare pieces is indeed exciting. Also yesterday, I posted a three piece Seated dime consignment, all important varieties. By end of the day, two of the offerings were on hold. This week brings a world coin consignment that is heavy in Great Britain and Canada pieces along with the 19th century type coin consignment previously mentioned in the Blog. The Mid-Winter ANA show held in Portland, Oregon is in the history books and initials reports are not flatterings in terms of attendance and sales volume. Eventually, some of the larger national shows (auction house and large dealer centric) will need to be closed down in favor of the more active regional events (collector centric). All national coin dealers have websites these days so their inventories are constantly visible and available for purchase (GFRC included). Show expenses are substantial when considering air travel, venue table fees, hotel cost and meals. These cost are absorbed by customers as higher priced coins. Why do many of these weak national shows remain? I believe there are multiple reasons. Some suggest the major auction houses are behind this issue. Auction houses need major shows to conduct auctions...where else can auction lot previews be done by dealers? The auction landscape has changed dramatically in the past 5-10 years with most auction bidding and sales being internet based but the physical lot viewing still needs a venue with a large number of dealers. Have you physically attended a Heritage auction(s) recently? There are smaller crowds in the auction room (mostly dealers) with a large percentage of sales going to internet bidders.....but the dealers are key as a backstop to absorb the coins that do not sell to internet buyers. Then there is tradition at the ANA, FUN and Long Beach. Do we really need a Mid Winter ANA show, three Long Beach shows and a summer FUN show? Even the June Baltimore show is known for being weak and dealers attend primarily to maintain their good standing and table positions with the Whitman promoters. The giants in the numismatic industry drive the need for multiple national shows and transfer these costs to the market. Think about 17.5% buyer's fees at the major auctions houses as an example of costs being passed to the collectors and smaller dealers. At GFRC, cost management is an imperative to enable low commission rates and directly support the collectors who are the core aspect of the numismatic industry. Today's major tasks include several express shipments followed by tax reporting preparations as April 15th is not far away. There are still more Birmingham Collections dimes to be loaded on price lists and bright sunny weather would be welcomed to complete the photography of certain pieces. The featured coin of the day is from the Maine Collection. By now, everyone who reads the Blog knows that the Maine Collection pieces were stored in Wayte Raymond album pages in a bank box since 1965. This 1863 Copper Nickel Indian Cent is a near gem and just back from NGC grading. Bold luster from uninterrupted surfaces in the hallmark of this lovely example. Reverse has substantial die crack from 8:00 - 10:00 that could become a retained cud with more strikes. Don't be bashful to contact me on this piece or any other Indians with an offer. Daily Saving Time arrived this morning...bummer as I awoke early to write the blog and then realized that extra hour to prepare the blog just evaporated into thin air! At least the arrival of DST implies that Spring is here and weather relief is on the way. I wish to open today's blog with the new Liberty Seated Collectors Club logo in the event that some readers are not E-Gobrecht subscribers. One of my imperatives as the new LSCC President is club member education and quickly moved to recruit John Frost as the Educational Director. John will be reformatting some of the older LSCC website presentations and a standard template was necessary. John inquired about a club logo for branding purposes on the presentations and the response to that question was a three month project to design a modern club logo. The final selection went through considerable editing as ideas were explored and club member feedback arrived after publishing design options in the E-Gobrecht. The club is so fortunate to have Jim Macor, an LSCC member and graphic artist by trade, as the designer. If one looks carefully at the recent Gobrecht Journal issue, the logo is visible on page 2 header. If you are not an E-Gobrecht subscriber or LSCC member, then please email to discuss as I would enjoy having you as a club member. Yesterday's productivity was low due to working too many late evenings last week. By 8:30pm and due to a lovely shared bottle of wine at dinner, I was in bed. This morning I'm back in the office early and have lots of raw Liberty Seated dimes to add to the price list due to a small varieties centric consignment and the Dansco set that needs to be broken up and sold for a customer. Below is one of the three pieces from the Seated dime varieties consignment and a most special offering. This is one of the finest examples I have seen for the F-107 Misplaced Date variety. The surfaces are original with old leather type toning. The reverse die polish lines through U(NITE)D are incredible on this piece! My close friend, Bill Bugert, discovered this variety years ago and was first published by Brian Greer during 1992 in his DLRC Guidebook. Since that time few have appeared in EF-AU grades....Seated dime variety collectors should take notice here. Did anyone notice that I have decided to sell the Kam Ahwash 1842-O dime that now resides in NGC MS62 holder? Since I already own a PCGS MS64 CAC F-105 in my set, then it was logical to offer this example to GFRC customers. If one checks the Seated Dime AU-MS price list, there are two 1842-O dimes offered in Mint State grade (PCGS MS62 CAC from Birmingham, NGC MS62 from Kam Ahwash and at CAC for review). I would not have dreamed two years ago of the opportunity to stock such incredible dimes. But there is more.....the same price list has a lovely 1858-O dime graded PCGS MS63 and just approved by CAC. But guess what? The Birmingham Collection also features an 1858-O PCGS MS63 dime that also was approved by CAC. Following are earlier images that need to be redone today to properly highlight this special piece. GFRC now offers two 1842-O MS62 dimes and two 1858-O MS63 dimes at once....I could not have believed possible and thank you to all the consignors who trust me with these wonderful coins. Welcome to the weekend Blog edition and thank you for visiting. The first weekend of March arrives with the realization that GFRC is moving back to Maine in less than 30 days. Northern customers are reporting that the weather is starting to show signs of spring and a warming trend. Preparations to move GFRC will start within two weeks as I inform customers of the transition and ensure that mail is not caught up in the Florida to Maine forwarding loop. The Auburn Lake condo painting project is also wrapping up next week with a site walk through on Friday for developing final punch list of touch up issues. Where does the time go? The Birmingham Collection CAC submission arrived back yesterday. These noteworthy dimes look even better with CAC approval stickers and my plan is to conduct a new photography session and improve current images taken before submission. Another shipment is off to CAC today including several customer coins and the Kam Ahwash 1839-O and 1842-O dimes as I believe CAC approval is a significant differentiating factor in the current market place. Speaking of current market place, I took a short break yesterday from the daily GFRC coin/image processing routine and studied eBay and a number of major dealer websites. Competitive benchmarking was paramount in the semiconductor foundry industry as one constantly needed to stay current with process technology and circuit design feature enhancements. The same is true for the numismatic marketplace as the TPGs and major dealers/auction houses alter their online strategies for attracting customers and generating sales. There were several observations from a combined collector and customer friendly dealer perspective. These are personal observations and I'm sure there will be those who will disagree. - eBay is used primarily for two purposes; moving problem coins or less attractive pieces at discount prices or secondly, a marketing tool for better quality coins at elevated prices. To be honest, I have stopped using eBay as a Newps source as the exercise is frustrating as one has to look through so many problem coins to find the needle in the haystack. Jim Postin and GFRC-Coins work hard to offer nice original quality coins on eBay at competitive prices along with several other reputable dealers (some who are LSCC members). But they are in the minority. As tempting as eBay can be to new collectors, my advice is always caution...especially on raw coins. Avoid eBay (or be highly selective) if you are planning to build a quality collection and leave this market place to the cherrypickers and value collectors. - Large volume dealers and auction houses are cross marketing coins. As I search around, many of the same coins are seen listed on multiple websites at different prices. This environment is highly transactional in nature with coins treated as a commodity to be flipped against sales volume goals. Can high volume dealers truly differentiate the better from average coins and advise collectors? Specialty dealers remain online with limited inventories of better quality coins as these coins sell quickly if priced at reasonable levels. - The 2014-2015 timeframe may become a black eye for PCGS given the wide grading variance seen for Seated coins in their new holders with the reverse Dupont hologram. PCGS invests a substantial amount of monies into website development but the core service remains accurate grading. I have become acutely cautious when looking at PCGS coins in these new holders as too many problem coins have been certified. There is almost a sense of relief when viewing PCGS coins in older blue label holders. It is paramount that collectors learn to grade along with understanding the appearance of naturally toned silver. It is a skill that is applicable to all silver coins regardless of the country of manufacture. As stated in earlier blogs, CAC approved coins should be considered when attempting to build a noteworthy collection. This statement is predicated on fact that John Albanese maintains consistently strict standards and employs the same graders/evaluators on a long term basis. CAC does not evaluate modern coins, world coins or colonials. This is a clear statement that graders do have a limited bandwidth and evaluating coins within their sphere of expertise is critical towards maintaining a consistent output. Ok, I will step down from my soapbox......... These comments were made as personal observations as a collector recently turned dealer. The collector blood still flows in my veins and I don't have corporate sale goals to meet. Rather, my purpose for building GFRC is to provide an alternate online platform for collectors of all capabilities and financial means. One customer just commented that I reminded him of an old time dealer that provides old time personal service. Good morning everyone and thank you for visiting with me this Friday morning. Yesterday was a long day as worked until 12:00am to finish loading the recent Great Britain centric consignment on world coin price list. The consignor is so pleased with the attention given to his coins that another shipment of nice Canadian and British pieces will be shipped next week along with a Walking Liberty 50c lot. The real reason for working so late was taking in the Tampa Bay Rays first spring training game here in Port Charlotte. We had third row seats behind home plate and saw a major league quality game with $24 tickets. The Rays were hosting Baltimore Orioles and both team had their top players in for 4-5 innings. Pitching was sharp and scoring did not occur until the late innings when backup players were on the field. I was impressed. After returning to Venice home, one of our good friends emailed with Boston Red Sox spring training season tickets and we jumped on the opportunity. Back to consignment reporting....a new Liberty Seated dime consignment arrived yesterday (the usual USPS pink slip for PO pickup) that contains nice varieties for Open Registry set collectors. This will be retrieved today and reported upon in tomorrow's blog. The consignments continue to arrive on a regular basis and are keeping me busy. Next week, I plan to drive around the Sarasota/Tampa area and will be visiting multiple coin shops along with taking in the Ft Myers Coin Show on March 14. In yesterday's blog, I mentioned the $1200 spot gold price that appears to be the new floor for this commodity. If gold spot prices are indeed manipulated or controlled, which I believe to be true, then why has gold settled at this price level? If James Rickards is correct and global major banks are allowing China to accumulated large quantities of gold bullion, then why is the acquisition price set at $1200 per ounce? The answer lies with gold miner production break even costs. Performing a quick Google search for "gold miners breakeven cost" resulted in several interesting links with the following being an excellent explanation of the gold mining production process and cost basis. http://www.coindesk.com/microscope-true-costs-gold-production/ Reading this article indicates that gold mining is quite energy dependent and cost/oz estimates, before the big oil price drop, were in the range of $1000 - $1200 per oz depending on the miner's size, geographical locations and ore quality. With the sharp drop in oil prices, then gold miner breakeven are marginally lower than these numbers. At a $950 production cost and spot price of $1200, the result is about 29% gross operating margin. Gross operating margins do not include corporate overhead which need to be included to determine net profit margins. A 25-30% gross margin allows for most well managed companies to operate on a long term basis with a small amount of monies for maintaining existing facilities (maintenance capital expenditures.) However, these types of companies are not good investments. If we connect the dots further....a significant rise in oil prices will place pressure on gold miners and if the world financial instituations want China to get this gold, then prices will have to increase to the $1300+ level but not much more. Therefore I believe that the $1200 floor is in place for gold. The featured coin of the day in another piece from the Birmingham Collection. This 1840 No Drapery dime graded PCGS MS64 and approved by CAC has yet to be loaded to the price list as I'm not fully pleased with the images. I expect the CAC return shipment to arrive today or tomorrow and will once again photograph this piece. So below are initial images of a really incredible dime and worthy of the most advanced collections. Yesterday was a relative quiet sales day; I was able to add the most recent world coin consignment to price list, add the NGC graded Maine Collection Indian Cents and also complete Birmingham Collection image editing with a few more pieces reaching the price list. The world coin consignment features a nice Great Britain 17th through 19th Century copper type set and a few other offerings. I really enjoyed photographing these pieces and will be adding the individual descriptions today. GFRC sales to Shanghai customers continue though yesterday's conversation with my customers support what is being read in financial news. China's economy is indeed slowing down and below the official government GDP growth statement of 7.0% A substantial portion of that figure is tied to government projects including ghost housing and corruption. Once needs to remember the amount of university graduates that enter the China job markets in Shanghai and Beijing on an annual basis. It is a staggering number and the employment market is incredibly competitive. Frankly, I am so happy to be back in the United States and operating GFRC rather than working for a China state owned semiconductor company.....Back to conversations with Shanghai friends/customers. We are trying to determine if GFRC can make inroads into the Shanghai world coin market. More consignments are being committed. The consignor of the Seated quarter pieces that sold out on Tuesday is sending a larger group early next week. He is breaking up an EF type set and a few highlights include 1831 5c, 1832 10c, 1831 25c, 1838 no drapery 25c, 1852 25c, 1889 25c, 1840 $1 and 1875-CC T$1 with a single unobtrusive chopmark (would be a great piece for Open Registry Seated type sets). Another consignor emailed and offered the following lone Seated quarter which I gladly accepted. This is a CAC approved example and will be loaded to price list later today. Welcome to another Wednesday and thank you for visiting the Blog today. The GFRC "collector experience" and business model appears to be gaining momentum based on yesterday's results and website statistics. Maybe the Gobrecth Journal advertising was also a factor..... My Hostway web statistics for yesterday indicates nearly 500 hits to the For Sale page and over 220 hits to the Daily Blog. When GFRC was initially launched, I dreamed of having this amount of daily traffic to the website. There is strong demand for strictly original collector coins whether in TPG holders or raw. PCGS, with its online marketing creativity, has innovated and established itself as the leading TPG company. But collectors must use PCGS holdering services to participate in their online functions. What about the core collectors in our industry who build quality Dansco sets? This is another important market segment that essentially has been abandoned by the slabbing phenonemon. Should these individuals be force to buy original coins in slabs and then cracked them out to be placed in Dansco's followed by another trip to the TPGs before selling? I think not.... The market still needs dealers who have the essential numismatic knowledge to deal in raw and slabbed coins with the focus on the coins themselves. Yesterday, I posted the small Seated quarter consignment to the price list. The three quarters sold within a day along with the seated pinback brooch. These were strictly original raw pieces that were well photographed and described. Demand remains for quality raw coins and at GFRC, I plan to support Dansco collectors as well as the advanced collectors. The GFRC consignment model is applicable for both quality raw coins and slabbed ones too! The Canada and Great Britain world coin consignment is fully photographed and will be listed today. This is a very strong raw coin consignment with nearly every piece being strictly original and capable of TPG certification. Then there is Birmingham Collection Part 3. I continue to slowly add these to the price list to allow collectors an opportunity to understand the quality and ensure the pieces receive proper attention for what they are. After Birmingham and the Canada/GB world coins are loaded to price list, I will have time to handle more consignments before the Baltimore show. If you have quality 19th Century duplicates, please consider GFRC as a possiblity for marketing and selling these. I would also be grateful to anyone who works with me towards building the World Coin platform. There is a serious need in the marketplace for a collector to collector trading desk for world coins given the steep dealer purchase discounts. Patience and persistence are essentially elements when establishing an alternate business concept. The featured coin of the day is from the Birmingham Collection. This is a wonderful 1884-S Liberty Seated dime with rich blue/gray obverse patina and intermixed rose on the reverse. There is substantial luster under the patina that makes this piece a joy to view under bright light. It is accurately graded as MS64 by PCGS. At times, it is so tempting to add a few of the Birmingham piece to my own collection but current priorities are to expand GFRC inventory. This 1884-S dime will be posted to the price list shortly. I can't believe how quickly each day goes by when multi tasking across the GFRC business and the Auburn Lakes condo painting project. The port to a new laptop has added another layer of complexities to overcome; difficulties getting at certain websites due to forgotten auto saved passwords on the old Dell and a discovery that new laptop is adding a green tint to processed images. Yesterday, I worked until midnight processing images and attempting to get new offerings on the price list. Hopefully today will be a more productive GFRC day and a host of new coins will reach the website. Two strong consignments were retrieved from the post office yesterday and will be photographed and added to price lists in the next 48 hours. The first is from a GFRC customer who needs help with the sale of quality Seated quarters. Included in that group are; 1851 VF25 nice original gray, 1873 Open 3 VF30 choice original gray, 1873 Closed 3 original AG-3 and finally, an AU 1865-S pinback love token with original hardware in perfect working order. The latter is real high on the cool scale. The second is from a previous GFRC consignment but this time he sends a nice lot of Canada, Great Britain and Germany pieces to aid with the expansion of that price list. His Great Britain consignment features; 1799 Half Penny AU, 1841 Half Penny MS, 1884 Half Penny AU, 1900 Half Penny MS, 1854 Penny AU, 1890 Penny Ch AU, 1900 Penny XF, 1902 Penny Ch AU 1898 Shilling AU and 1688 Crown VG+. Canada pieces include 1899 10c small 9s AU and 1858 20c VF. Finally the German piece is a 1905A Mark MS63. Also underway is price list reformating to modernize their appearance and faciliating an easier stroll through the image icons. So far the upgrade includes, CAC, Indian Cents, Seated Dimes AU-MS, Seated Quarters (both) and the Bust Halves. More will be done today as time allows. Let's close today's Blog with an article that arrived in my Inbox yesterday. The author is James Rickards, a staff writer for the Daily Reckoning, with the subject being gold price manipulation. Jim is the author of "Currency Wars" and his article renders several important points. First is that gold prices are indeed manipulated on a global basis and second, China needs to acquire a substantial amount of gold to balance its foreign reserves holdings on par with the major westerns powers. It is common knowledge that China has been accumulating gold at an unprecedented rate with suggestions the reason is to launch a war against the US dollar as world reserve currency. This article suggests that the United States is helping China's gold accumulation as an approach to maintain the US dollar's reserve currency status. I've copied the article and shown here is smaller font for those who may be interested in reading. A lot of people think about gold as a percentage of a country’s total reserves. They are surprised to learn that the United States has 70 percent of its reserves in gold. Meanwhile, China only has about 1 percent of its reserves in gold. People look at that and think that’s an imbalance. But those are not very meaningful figures in my view. The reason is that a country’s reserves are a mixture of gold and hard currencies, and the currencies can be in bonds or other assets. The United States doesn’t need other currencies. We print dollars, so why would we hold euros and yen? A better metric, in my opinion, is to look at a country’s gold holdings as a percentage of GDP. GDP is a representation of how big a country’s economy is. It’s the gross value of all the goods and services. There are different measures of money supply -- M3, M2, M1, and M0. In a money economy, however, you can say that the country’s gold holdings are the real money. I call a country’s gold reserves gold “M-subzero”. The IMF officially demonetized gold in 1975. The U.S. ended the convertibility of gold in 1971. Gold disappeared “officially” in stages in the mid-1970s. But the physical gold never went away. Today, the US has about 8,000 tons. We haven’t sold a significant amount of gold since 1980. We dumped a lot of gold in the late 1970s to suppress the price, but none after that. So one of my questions for central bankers is, if gold is such a ridiculous thing to have, why are we hanging onto it? But that’s a separate question. What do want in a poker game? You want a big pile of chips. Gold serves as political chips on the world’s financial stage. It doesn’t mean that you automatically have a gold standard, but that the gold you have will give you a voice among major national players sitting at the table. For example, Russia has one-eighth the gold of the United States. It sounds like they’re a small gold power -- but their economy’s only one-eighth as big. So, they have about the right amount of gold for the size of their economy. The U.S. gold reserve at the market rate is about 2.7 percent of GDP. That number varies because the price of gold varies -- but it’s around 2.7 percent. For Russia, it’s about 2.7 percent. For Europe, it’s even higher -- over 4 percent. In China, that number is 0.7 percent officially. Unofficially, if you give them credit for having, let’s say, 4,000 tons, it raises them up to the US and Russian level, but they want to actually get higher than that because their economy is growing. Here’s the problem: If you took the lid off of gold, ended the price manipulation and let gold find its level, China would be left in the dust. It wouldn’t have enough gold relative to the other countries, and because their economy’s growing faster and because the price of gold would be skyrocketing, they could never acquire it fast enough. They could never catch up. All the other countries would be on the bus while the Chinese would be off. When you have this reset, and when everyone sits down around the table, China’s the second largest economy in the world. They have to be on the bus. That’s why the global effort has been to keep the lid on the price of gold through manipulation. I tell people, if I were running the manipulation, I’d be embarrassed because it’s so obvious at this point. The price is being suppressed until China gets the gold that they need. Once China gets the right amount of gold, then the cap on gold’s price can come off. At that point, it doesn’t matter where gold goes because all the major countries will be in the same boat. As of right now, however, they’re not, so China has though to catch-up. There is statistical, anecdotal and forensic evidence piling up for this. All of it is very clear. I’ve also spoken to members of Congress, the intelligence community, the defense community and very senior people at the IMF about it. China is our largest trading partner. It's the second largest economy in the world. The US would like to maintain the dollar standard. I've described some catastrophic scenarios where the world switches to SDRs or goes to a gold scenario, but at least for the time being, the US would like to maintain a dollar standard. Meanwhile, China feels extremely vulnerable to the dollar. If we devalue the dollar, that's an enormous loss to them. That’s why, behind the scenes, the U.S. needs to keep China happy. One way to do that is to let China get the gold. That way, China feels comfortable. If China has all paper and no gold, and we inflate the paper, they lose. But if they have a mix of paper and gold, and we inflate the paper, they'll make it up on the gold. So they have to get to that hedged position. Gold is liquid, but it's a fairly thin market. If I call JP Morgan and say, "Hey, I want to buy 500 tons of gold," I can't do it. That would be a huge order. An order like that has to be worked between countries and central banks behind the scenes. It's done at the BIS, the Bank for International Settlements, in Basel, Switzerland. They're the acknowledged intermediary for gold transactions among major central banks and private commercial banks. That's not speculation. It's in the footnotes of the annual BIS report. I understand it's geeky, but it's there. They have to acknowledge that because they actually get audited. Unlike the Fed and unlike Fort Knox, the BIS gets audited, and they have to disclose those kinds of things. The point is that is that there is so much instability in the system with derivatives and leverage that we're not going to get from here to there. We're not going to have a happy ending. The system's going to collapse before we get from here to there. At that point, it's going to be a mad scramble to get gold. The featured coins of the day is from the Birmingham Collection Part 3 and yet to be posted to the price list. This well struck example is graded PCGS EF45 with nice original color and an excellent strike. However, one can see the tendency for a green color basis within the images. This is one of today challenges..updating the image processing routine to bring balance to image colors. Once the Birmingham Collection arrive back from CAC review, I will once again photograph all pieces and replace on the price list. Welcome to the first week in March and thank you for stopping by at the GFRC Blog. The Portland, OR ANA show is this week with much of the numismatic hobby's attention shifting to the West Coast. After attending a weak Spring ANA in Atlanta last year, I decided to by pass this show and instead prepare for Baltimore, Central States and Denver in the upcoming three months. The transition to new Dell laptop is essentially done with only one important program not porting. Until I can solve a start-up issue, image cropping is still being done on the old Dell. The new laptop allowed for a critical look at the GFRC website and potential improvements. During the next few weeks, you may notice some subtle changes to the price lists to increase image icon sizes and other modifications. Individual coin images are also increasing to 500x500 resolution when viewed by clicking on the image icon. I worked late into Sunday evening processing the Birmingham Collection Part 3 images along with the Indian Cents and those are ready for cropping and loading onto price list this afternoon. For Liberty Seated Dime collectors, Birmingham Part 3 brings a host of quality offerings that would be typically seen at major auction. There is an incredibly original 1859-S PCGS EF40 that received CAC approval and will be highlighted in tomorrow's blog. Also note the lovely 1809 O-105 Bust half graded NGC AU50 that was added to the price list yesterday. This is an incremental consignment from a new GFRC customer/consignor. Two consignments arrived on Saturday while I was shopping for new laptop; those will be retrieved this morning and announced in tomorrow's Blog. From discussions with the consignors, the first contains a group of raw Seated quarters including an original 1851 in VF grade while the second is a nice lot of Great Britain coins. Sales were strong this weekend and the amount of two day USPS Priority boxes staged in the office is at record level. Today's first task is to prepare packages and enable the good folks at USPS to do their job. Mail between Florida and the rest of the country slowed during February as a result of the horrible weather and canceled flights. Let's hope that March brings a reprieve and quick transfer of payments and coin shipments. I wish there was more to discuss in this morning's blog and hope you understand the amount of time involved in the computer porting and bringing GRFC business back into normal operating mode. As a reminder, the Whitman Baltimore show is only 3.5 weeks away and this would be the ideal time to consider a GFRC consignment. Your coins will be well marketed as W. David Perkins and I have reserved a combined corner and regular table at the show and will have nine cases of display space. Tables 1054/1056 will be the meeting place for JRCS and LSCC members and an opportunity to showcase your coins. I am planning a dedicated case for World Coin offerings also as this product line continues to ramp and is gaining early attention. The featured coin of the day is the previously mentioned 1809 O-105 Bust half with pretty old album toning. This early piece has bold luster and rich gold rims under bright light. Strike is typical for the date. My old Dell laptop running XP finally reached its replacement point yesterday. After rebuilding the Dreamweaver FTP access file and writing a blog, the laptop's ethernet card was nearly non responsive. It was time....I bought this Dell back in 2005 before moving to China and it served me well for many years. By noon time, a trip to Best Buy resulted in the purchase of an incredible Dell Inspirion 15 laptop with 15.3" screen and Windows 8.1. I spent about 9 hours porting software and files from the old to the new and happy to report that this blog is being written from the new Dell. For all the negative comments and complaints about Windows 8.1, I find it fairly easy to learn while still allowing a Desktop and folders configuration that is not that far off from my old XP machine. Then there are the massive improvements in speed and file handling.....but you did not visit today to read a blog about Dell laptops. The March E-Gobrecht issue was published by Editor Bill Bugert on Friday and is issue #122 which matches the number of Gobrecht Journal issues to date. This E-G edition is really incredible if one considers the amount of articles and the depth of each contribution. There were times when the E-G would be mainly the monthly columns and maybe 1-2 incremental articles. Today, the LSCC has a host of numismatic industry personalities writing for our publication. I'm also very pleased with the in depth discussions and draft model reviews for our new logo. This logo is innovative but maintains the key elements representing our club and its mission. Well done Jim Macor and the LSCC officers for your patience as the logo was developed and optimized. Club members should be received the latest Gobrecht Journal starting on Monday. As for GFRC, two consignments arrived today adding to the backlog of coins to be photographed and listed starting tomorrow (there is no rest for this small business owner). I've posted the Birmingham Collection 1845-O PCGS AU50 dime to price list since it received CAC approval. Many more great coins are coming shortly and I hope GFRC customers will continue to check in often. As for Indian Cents, these will be added to price list shortly and all NGC graded; 1859 AU55; 1861 AU58; 1862 UNC Details; 1863 MS64 and choice; 1865 AU55 BN; 1873 Open 3 AU50 BN; 1874 AU Details; 1875 EF45 BN, 1881 MS63 BN; 1886 Type 1 AU53 BN; 1883 MS64 BN; 1884 MS65 BN. Adding the pieces that are already listed, it is obvious that the Maine Collection set was better than average and hopefully will find a good home. So Sunday will be a busy day for loading up the price lists and Monday's focus will be on packing and shipping orders. A sincere thank-you to all GFRC customers for your ongoing support, feedback and positive comments. I want to be your number one source of quality coins and understand this will take time to assemble a broad and quality inventory. The featured coin of the day is the Birmingham Collection 1845-O PCGS AU50 with CAC approval. When this dime arrived several weeks back, it was like an old friend coming back to visit. Astute collectors will immediately recognize how special this dime is at the certified AU50 grade with CAC approval. It is choice and strictly original...few are seen like this.